These VHDCI cables are extraordinarily high quality, built on genuine Madison branded triple shielded, twisted pair cable with the highest quality connectors. UL 20276 approved and certified to 320MB/s speed. The connectors used by this cable are Offset versions. This has the advantage of being 100% compatible with standard VHDCI (UHD) sockets, whilst also fitting cards with high connector densities. 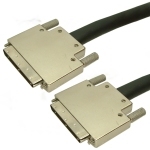 NB: The VHDCI connector is also known as UHD (Ultra High Density SCSI). These cables are not a stock item, and are manufactured to order. Please contact us to confirm lead time.